Even though it’s beautiful here in the Pacific NW right now – Can I just say, I’m ready for a VACATION?! An extended vacation, with plenty of beach time, tropical cocktails and an endless supply of US Weekly magazines. We’re planning a trip to Maui in the late fall and I absolutely cannot wait. I’ve been to Hawaii twice before, but only to Waikiki. I hear that Maui is a whole different vibe – Much more relaxed, and green and tropical. 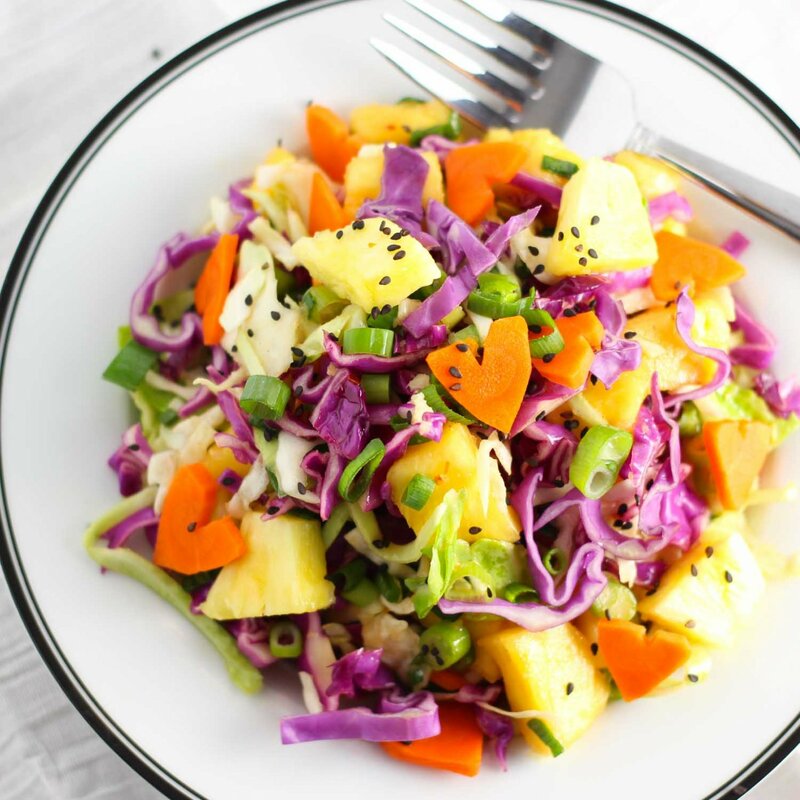 Thoughts of boarding that plane in November when it’s freezing and pouring down rain here in Oregon will help to get me through these next four months – That, and this Hawaiian coleslaw recipe which I spied on The Skinny Fork. 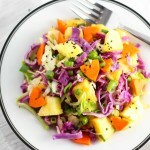 How can you not be in a good mood when you have a plate of this yummy Hawaiian coleslaw in front of you. Just look at all those colors – And the heart shaped carrots – I mean, how cute are they?! 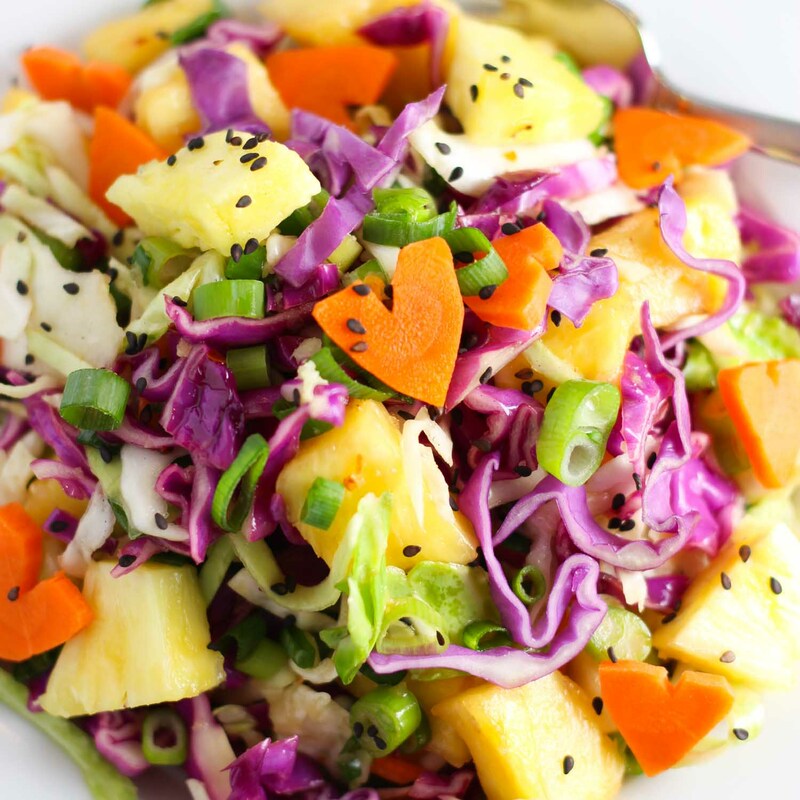 This Hawaiian slaw’s got the traditional ingredients of cabbage and carrots, but it’s bumped up a notch into tropical nirvana with the addition of fresh pineapple chunks, black sesame seeds, and a ginger-soy lime vinaigrette.This Hawaiian style coleslaw is super healthy too – Which helps in the being bikini-ready department. Now if I can just stop stealing all those pink starbursts from our office reception candy dish, limit the wine drinking, and get in some more workouts, I’d be all set… But really… I mean, wine is pretty much a necessity. Have any of you been to Maui? Do you have any tips for must-see places, must-taste restaurants, must-drink cocktails? I’d LOVE to hear your suggestions in the comments below! Mahalo. Add the remaining ingredients to a mason jar, shake well to combine, and pour over the slaw. Stir to combine. Cover and let sit in the refrigerator for 30 minutes prior to eating. I used this great tutorial from Sophistimom to make the cute heart shaped carrots from one of the carrots, for topping. If you loved this Hawaiian Slaw recipe I would appreciate it so much if you would give this recipe a star review! Also, be sure to snap a picture of your finished dish and share it with me on Instagram using the hashtag #platingsandpairings and tagging me @platingsandpairings. This slaw looks so refreshing, and I love those little carrot hearts! We just got back from Hawaii last week. It was my first trip over, and I totally embraced my inner tourist. We stayed in Waikiki, but spent a lot of time up on Oahu’s North Shore, which was much less trafficked and more easy-going. We had so much fun, and came back rested and ready for life again. It’s amazing what a little vacation time can do for the soul! I totally agree Renee!!! I just read your post about how to avoid sunburn – Keeping this information handy for our trip!!! I got a little fried last time. Hi renee ? I’ve been there four times and never get tired of it . Great beaches great golf courses and great food . Wow that looks good! I went to Maui when I was a kid but not since so no suggestions unfortunately. It was one of our favorite family trips ever though – such a beautiful place! I can’t wait to get back to Hawaii Ali – Luckily this beautiful summer that we’re having here in Oregon makes the waiting time bearable! Susannah – I hope you make it!!! Let me know how it turns out! This looks AMAZING. I love that you made the little carrots into hearts as well! Aren’t they cute Jenni?! I’m trying to come up new with recipes involving carrots just so that I can use them more and more!!! Thanks so much Susan! I’ve bookmarked this helpful information for our upcoming trip! Yes! This looks delicious and awesome for hot summer days. I love those carrots! So cute! The fall is the perfect time for a trip to Maui. And planning trips is always fun and gives you something to look forward to! I couldn’t agree more Erin! I can’t wait to start planning and daydreaming! Oh yes! Snorkeling is my absolute favorite thing to do in Hawaii! Can’t wait for that!!! Thanks Jen! This does look delicious! I love the idea of the vinaigrette, and I’m a big fan of sesame seeds. They add just a little crunch. 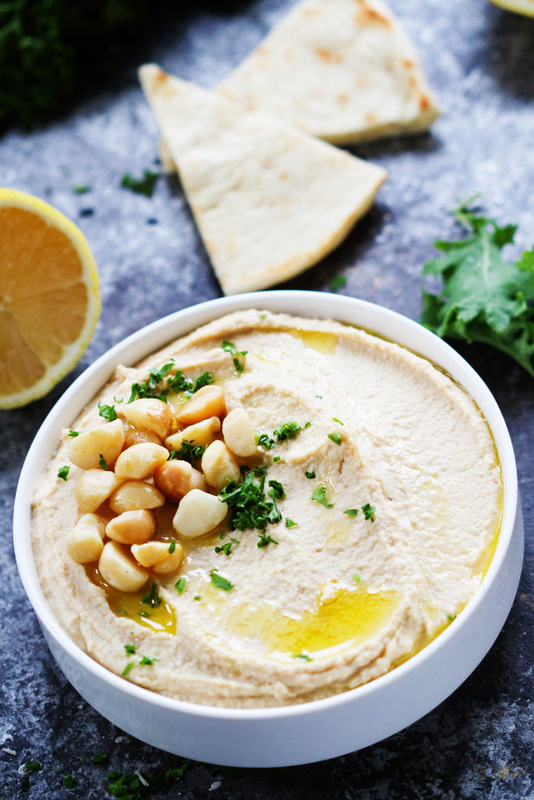 It’s a light, health dish with plenty of crunch! Perfect for summer BBQ-ing! Heart-shaped carrot! Love that. And the colors. Eating beautiful-looking food makes it taste better, definitely. Hawaii is so amazing! I’ve been once, but my husband has not. We are dying to get over there. I have a friend who lived there most of her life and she tells me the weather is so perfect. Warm, but not too hot. Sounds idyllic. Hope you have the best time ever! Also, this slaw has me drooling, so I will be pinning this for later! 😀 Cheers! Thank you Danielle! I hope you enjoy the slaw and that you make it to Hawaii soon too! Wow what a wonderful and tasty sounding recipe! I LOVE the colours in this slaw! It looks so summery and refreshing!! The colors are great, aren’t they Elysia! I love the purples and oranges together! just started following you. i really enjoy your blog. made the street tacos and pickled onion last night fabulous! thank you for sharing. i lived on maui for 9 yrs til last year. all time favorite is sansei in kapalua. when my family always came to visit it was a must. best ever. i am not a sushi fan but there are so many more options. you need to go. highly recommend reservations. they have a very late happy hour as well. merriment’s in kapalua as well, for happy hour. best spot on maui for a sunset cocktail and a great happy hour. starts at 3 i think. they pour hand mixed mai tai’s, not common. those are my fav’s. many more but those are my top two. enjoy! Ooooohhhh those hand made mai tai’s sound SO good Jan! I will definitely need to check out Merriman’s for their sunset and a cocktail. Thank you for the great feedback and welcome! Must do: Mount Haleakala sunrise. Dress warm. Sounds AMAZING Lane! We’ve actually scrapped the Maui trip for Spain this year, but I will definitely keep that on my “to do” list for next time we’re in Maui! This looks so fresh, summer-y and amazing! Definitely going to save this recipe and make it soon. A good summer salad can really add to a meal. Thanks! Made this cole slaw yesterday. I was very disappointed. A couple of things…..the red cabbage bleeds into the rest of the ingredients so the slaw looked nothing like your pucture. Also the taste was very bitter. Something seemed missing from the dressing. Erin, I´m so happy to see, that you use fresh ingredients and not a package coleslaw mix. It seems, people are unable to cut a cabbage today and then buy a pre cut, wrapped in plastic. But anyway, thank you for sharing, this will make my hawaii party perfect. So happy I could help Nico!